When you search for issues, Google Issue Tracker returns a customizable and savable table of issues that match the search criteria. This table allows you to add, remove and re-arrange columns that contain issue fields in order to select and highlight information that you want to see. The search results view also allows you to edit issues in bulk. The search results view is displayed by Issue Tracker when you perform a search using the search bar, search builder or search editor. 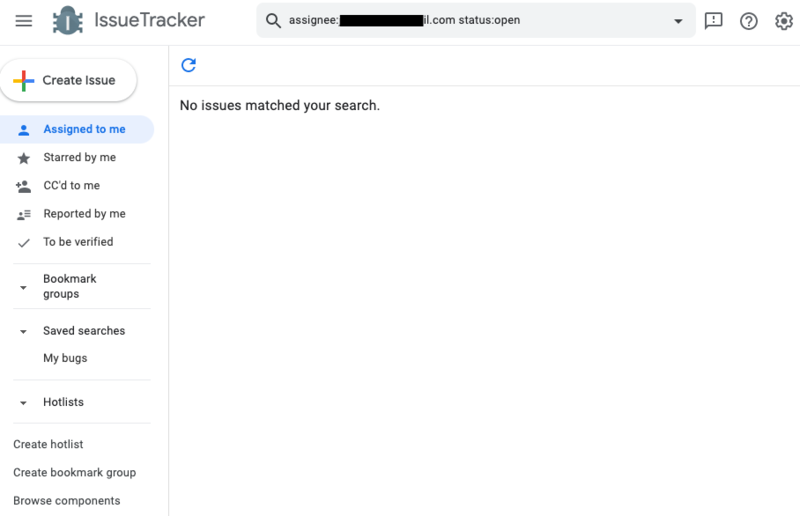 Issue Tracker also displays this view when you perform an implicit issue search, for example, using a hotlist or an item in the left-hand navigation. The search bar at the top of the page displays the criteria you used to find the issues displayed in the table. The number of search results returned is displayed on the top-right, along with arrows that you can use to navigate to additional pages of results. Each row in the table contains an issue that matches the search criteria you specified. You can click anywhere in the row to see the details page for an issue. Columns in the search results table represent issue fields such as Title, Priority and Status. If an issue doesn't have a value for a displayed column, Issue Tracker shows a table cell that contains the -- placeholder. You can click any column header to sort results by the corresponding field and click again to change the sort order from ascending to descending, or vice-versa. The field name in the column header is red if the results are currently sorted by that column. Issue Tracker uses stable sorting in the search results table. This means that when you sort first by one column, subsequent sorts are within the first sorting criteria chosen. You can add or remove columns from the search results table, with the exception of the Title column. For example, to add a column, position the mouse over a column title and select Add column right from the menu that appears. To reposition a column, click the column title and drag it to the desired location. These modifications to the column display persist when you perform future searches. Search results displayed from hotlists and saved searches have additional functionality. If you have Admin permissions and you modify the column display or sort order in the results page for a hotlist or a saved search, Issue Tracker presents a Save button that allows you to save the modification. The changes you made are then visible to other users when they view the hotlist or saved search results. Any changes to the column display or sort order made by those users are temporary and expire when the user session ends. The search results table has two permanent immovable columns on the left-hand side of the display. The checkbox can be used to edit issues in bulk. The star icon adds/removes issues from your Starred By Me list. Column widths cannot be manually adjusted. As columns are added to the table, Issue Tracker actively resizes the columns to the best of its ability. If values in a table cell overrun the available width, you can view the full value by hovering over it. If the number of columns exceed the browser window width, Issue Tracker displays a horizontal scroll bar. You cannot remove the Title column from the search results table. You can show any hotlists that contain an issue in the Title column by selecting the Show Hotlists option in the column drop-down menu. You can wrap the contents of Title and Components columns by selecting the Wrap Titles option in the column drop-down menu. You can show status icons instead of text by selecting the Show Status Icons option in the column drop-down menu. For fields that contain a time value (for example, the Created field), you can view the time in both local and UTC time by hovering over the field value. You can view a hovercard for an issue by hovering over the Blocked By, Blocking or Duplicate Of field if displayed.